Good work I wasn't convinced either. Hi Rosa ! I had to change some little things to have a perfect result. But yours looks nice though. Tu es cruelle en début de semaine ! moi je suis prete a me s a c r i f i e r pour ce dessert !! 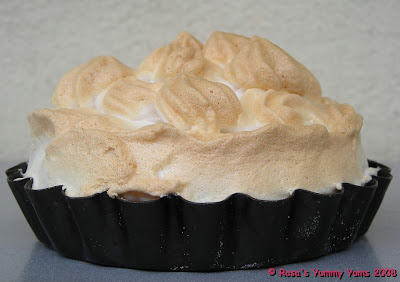 I'm so jealous of your meringue! :) It looks lovely, not like mine, which is too dark. I would love to have one of your little baby pies! Très appétissantes ces tartelettes bien sûr ! et la meringue est magnifiquement dorée. Your tart looks good even though you did not cherish it that much. Avec un bon thé, cette tertelette doit être un régal! i felt the same way about this recipe. 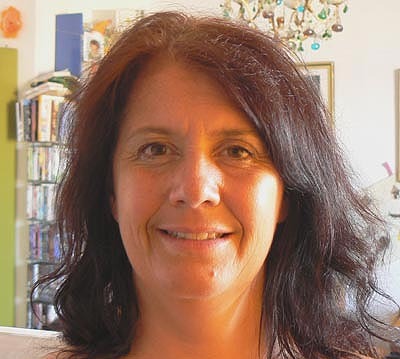 the result didn't have much oomph but it was a good experience. For me it isn't the perfect pie neither. Anyway your looks great! Your tarts look gorgeous! 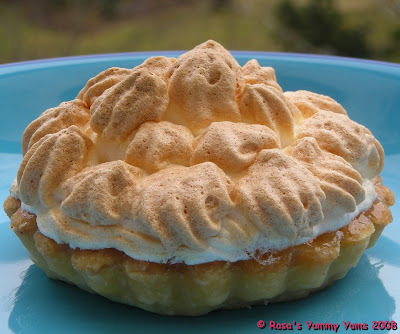 I love the meringue! Qu'elles sont appétissantes ! J'en aurais bien fait mon dessert ! Ca a l'air exelent!! J'adore les tartelettes au cirton, il faudra bien que je commence a jour a les faire!! Your mini pies look great and yummy...even though you didn't like it too much! Oh !!! 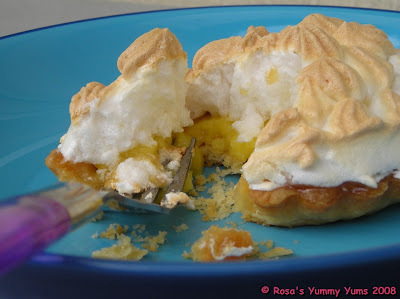 ce qu'elles me donnent envie tes petites tartelettes au citron avec cette meringue sur le dessus. c'est superbe ! Its funny how the opinions are pretty consistent. All goes to show the importance of a well wriiten recipe which I have taken for granted until now.Reagrdless they look great as usual. I wonder if it was the vanilla in the filling that masked the lemon slightly, making it taste a bit 'blah'? I tasted before and after adding the vanilla and definitely preferred it without. You're absolutely right that the taste was unsatisfying. It just slid off the palate rather than leaving a lingering zing. Still, your pie does look amazing! C'était la tarte que me réclamait continuellement ma fille lorsqu'elle était encore à la maison ! 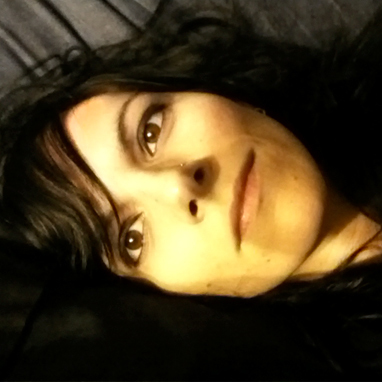 Tu me donnes envie d'en refaire ! 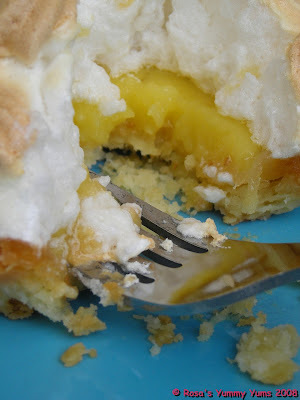 le probleme avec les tartes au citrons, c'est qu'on a tous notre recette preferee, apres on n'en change plus. Celle-ci avait l'air si bien reussie pourtant! 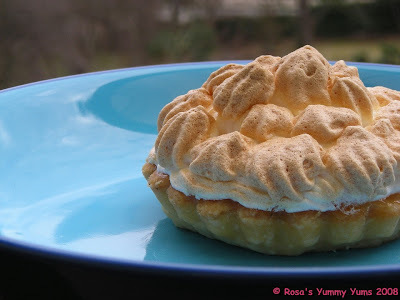 Rosa you got such beautiful meringue! I wouldn't call this an ultimate but I really did enjoy it. I am always impressed with each recipe how much there is to learn even if I don't like the end product. And yes it does finally come down to your own personal taste and that's wonderful! they do look lovely! can't wait to see what next month's challenge is! alors là, je dois dire que je suis bluffée !!! 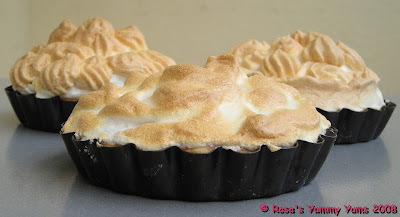 ta tarte est magnifique, et cette meringue toute dorée et si épaisse me met l'eau à la bouche ! I loved the pie but I had nothing to compare it to. Next time I would like to try yours. I want that gratifying and orgasmic explosion of pleasure. I dont think my pie had THAT! Yours look so deliciously beautiful! Je n'ai jamais vu une aussi belle meringue. 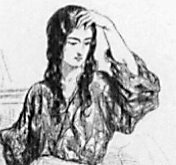 Si le secret est la crfème de tartre merci de nous l'avoir indiqué. C'est superbe. Your LMP looks great. Too bad it didn't live up to your expectations! Oh well....it looks beautiful!!! Well they definitely look beautiful -too bad they didn't live up to your expectations tho. It's a shame since you were actually someone who enjoys this dessert- it seems like a lot of DBers were not fans. 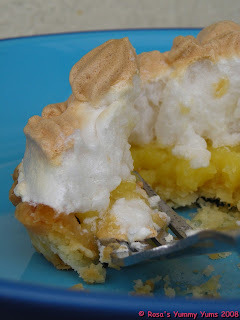 I used meyer lemons for the juice and had a really nice balance in tart and sweet- maybe the lemons can make a difference? They do look great even if they didn't knock your socks off! Your pies look great, even if you didn't enjoy the flavor! Elles sont pourtant bien jolies et appétissantes ces tartelettes. Dommage qu'elles ne t'aient pas plu après tout le mal que tu t'es donnée. Your tartlets look wonderful btw! I'm sorry to hear that you didn't like the pie. But they look very cute! Je suis ravie de voir cette recette aussi chez toi ! Bravo ! Je n'ai pas encore trouvé ma recette idéale de tarte au citron, et j'ai des addicts à la maison, je vais essayer la tienne, elle est magnifique! Je suis d'accord, ce n'etait pas la meilleure tarte au citron du monde...mais ca etait. La votre a l'air delicieuse!!! That last picture is the money shot. I thought the pie was okay - but not my mom's. I got nervous with how thick the sugar/ cornstarch mixture was...was curious to me! Your pies are very cute. I'm sorry that it wasn't your favourite, but good for you for perservering! 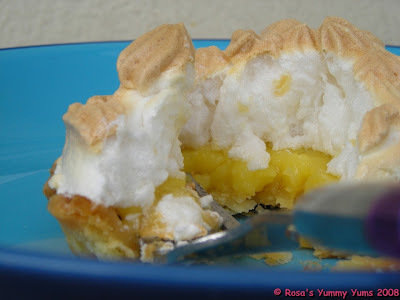 Je veux bien connaitre celle que tu preferes, si tu veux bien, car je n'ai pas de recette de tarte au citron en particulier; j'ai plutot confiance en ton jugement meme si tu dis que c'est au gout de chacun. Ces tartelettes ont toutes l'air plus délicieuses les unes que les autres. awww too bad you didn't really enjoy the pie so much, still congratulations on your great looking tartlets!! Sorry it wasn't memorable for you....they look great though. How sad you didn;t like it. Ihave yet to make it. Très jolie tarte! J'adore les petites pointes sur la meringue, trop mignon! Nice job! oh la la quelle tuerie !! Inspite of what You say, I think they look lovely and the curd has set so well..
totally agree with your review!!! :) your pies looked beautiful though! Rosa, c'est trop bon pourêtre mangé en 1 minute!!! WOW!!!!!! Tu es la reine des gateaux! Those tartlets rock! The lemon curd seems to have the perfect texture. Tout simplement superbe, moi, qui aime tout ce qui est "citron"!!! Mmmmmm! 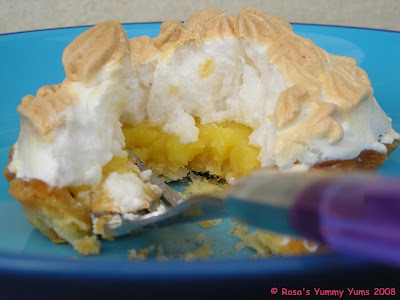 Des tartes au citron. C'est tellement bon. Ça donne envie d'en chiper une. Serait-ce le Tarte au citron's day?Chez moi aussi. Rosa, I'm sorry you were so dissapointed - I guess lemons and eggs vary so much don't they. I used large eggs and I think my meringue was a little too eggy. My filling was unbelievably lemony! Having said that - your tarts still look fantastic and there's always next month huh? Ces tartes sont magnifiques, la tarte au citron est une de mes tartes préférées. 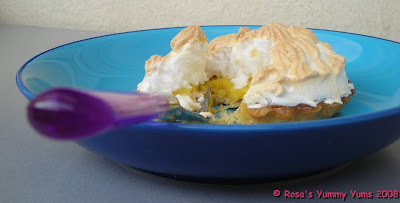 Ta meringue est très réussie, hummm !!! So sorry to hear that you didn't like these. Regardless, the tarts look amazing. I thought my meringue looked funny too and ended up making it twice. But after seeing everybody's results, I guess it's supposed to be this way. Even though you didn't love them, they did turn out beautiful! I felt similarly about the pie, Rosa. Your description of it as "sexless" is funny and pretty apt! 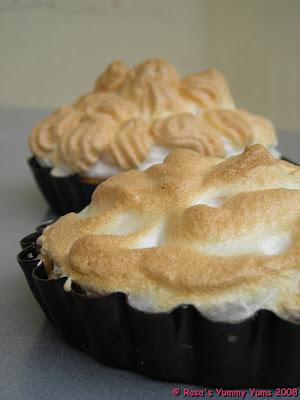 They do look handsome with the meringue swirls, though! Your little pies do look nice, though I can understand the sentiments about the pie. 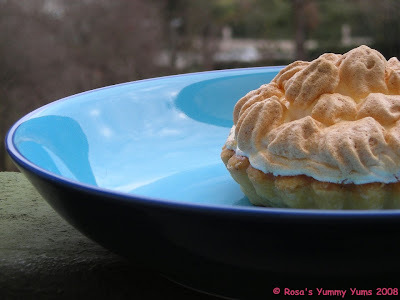 My husband raved over the flavor of the meringue, but me, not so much. Magnificent looking tartlettes, even if the taste wasn't what you were hoping for. Maybe next month. Ah well, it is always worthwhile to try these things out once. I found the curd very lemony--maybe it depends on the lemons. Wow, your tarts are so cute and pretty! The look delicious too :) Nice job as always! Your pies look lovely, even if you didn't enjoy them. Funny how there were such different reactions to the same recipe. I think the taste of the filling so much on which part of the world we were and got lemon. Mine was really tart and the texture nice and soft. It was quite unusual to make but interesting. Too bad you did not like it but glad you participated! Irrésistibles....trop mimis tes tartelettes ! Je fonds littéralement pour ces jolies peties tartelettes au citron! 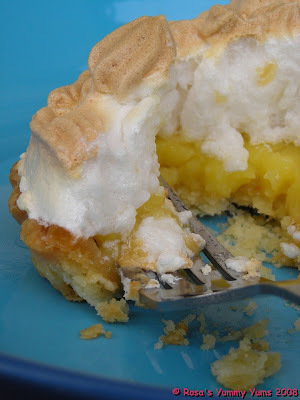 It isn't my favorite lemon meringue pie recipe, to be honest, but I didn't dislike it quite as much as you. Glad you kept with it though! Rosa, well they look good- sorry they left you wanting. I prefer the recipe of my Grandmother. But this was ok.
Beautiful job even if it wasn't your favorite! I'm sorry this one wasn't a wow for you. 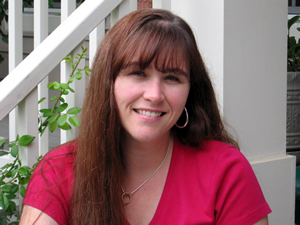 Like Lisa, I love the way you reviewed this... I totally understand (and have experienced) the "yeah, but" surface level of satisfaction you felt. 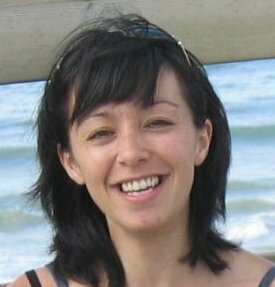 Ton blog est génial !...... ces petites tartelettes aussi d'ailleurs..... je n'en ferais bien qu'une bouchée ! 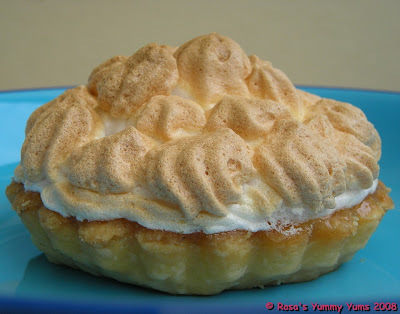 Your meringue is wonderful...crispy on the outside and fluffy and soft inside. I really enjoyed this and thought that my filling turned out very tart! My dad prefers a traditional pie crust, but I liked the sturdiness of this one. Your tarts look wonderful! Wonderful photos too! Ces tartelettes m'ont l'air tout simplement divines!